Will Riding Charlotte's Light Rail Turn You Into an Alcoholic? I have three meetings today: the first was a lunch meeting in South End, followed by a project meeting in Uptown, and this evening I have another meeting in South End (I'm writing this blog post during my downtime in between). So I figured I'd take the light rail from South End to Uptown and then back again once I'm done for the day and ready to go home. Riding the LYNX Blue Line today gave me the first opportunity to see one of the liquor ads that stirred up much controversy when the plans were announced last year. If you'll recall, last August, The Charlotte Observer reported that for the first time ever, the Charlotte Area Transit System (CATS) would begin selling alcohol--beer and liquor--advertising on the sides of city buses and trains to generate much-needed revenue to offset rising operating costs. This infuriated Charlotte City Council, who said they weren't aware of the decision and they expressed concern about children and recovering addicts who would see the ads. By late October, a compromise had been reached to begin selling the alcohol ads. I'm not sure when the first liquor ad appeared on the light rail, but I saw one for the first time this afternoon for Baileys. 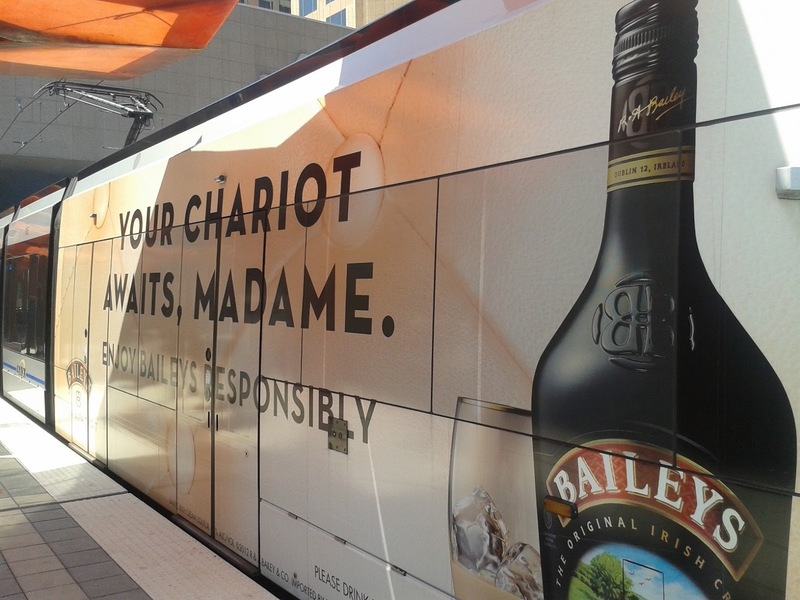 "Your Chariot Awaits, Madame," reads the large headline on the Baileys ad that covers the light rail car I boarded. I don't have a problem with it, and, in fact, I feel that the accompanying "Enjoy Baileys Responsibly" tagline could help encourage people to use public transportation rather than driving after leaving bars and nightclubs if they've had too much to drink. And, this particular ad looks cool. Big-city like, even (and you know how much Charlotte desires to be viewed as a big city). What are your thoughts on the whole alcohol-ads-on-public-transit thing? By the way, I realize this is the second liquor-related post I've written in as many weeks (here's the other), but there's no cause concern (Mom).